Thus, Rama entered the hermitage of Bharadwaja taking Sita with him and accompanied by Lakshmana and Guha. The sage appeared at the doorway and walked forward to welcome him, as if he was waiting since long to be blessed by the Darsan; seeing him, Rama prostrated before him, and when Bharadwaja lovingly embraced him and invited him to enter the hermitage, he was very happy to comply. The sage made them sit on the seats he had spread on the floor, for each according to his status. He inquired after the welfare of every one of them and declared that his heart's desire was fulfilled that day. He asked his pupils to bring fruits and roots, and placing them before his guests, he pleaded that they might partake of them. They spent the night in that hermitage, accepting the sage's hospitality and service. Seeing him filled with ecstasy, with tears flowing, Guha was overwhelmed with surprise. He said to himself, "O! What great good fortune is mine!" He was overcome by supreme joy. Meanwhile Rama suppressed His Divinity and acted as if he was just a man with common human attributes. While Sage Bharadwaja was dilating delightedly on the Rama Principle, Rama listened, as if it all related to another person called Rama and not to himself! He replied, "O! Foremost among sages! All those who are recipients of your hospitality are, for that very reason, adorable. All such are full of virtue and wisdom." The pupils, ascetics, sages and monks of the hermitage who heard the words of Bharadwaja and those of Rama were struck with wonder and filled with joy. After the holy bath at Prayag, Rama left the hermitage with Sita, Lakshmana and Guha, and entered the deeper recesses of the forest. Bharadwaja followed them as far as the river bank, and there he clasped Rama in loving embrace, wishing for them a happy journey. Rama prayed for the blessings of the Sage and said, "Master! Tell us which direction is best." The sage replied, with a laugh: "Lord! There is no path unknown to you in all the worlds, is there? You are playing the role of a mere man, in this habiliment. Well, since I have been asked, it is my duty to reply to the best of my knowledge." Thus saying, he beckoned to four of him pupils, and sent them with Rama to show him the track that led to the next hermitage complex. Those boys were delighted at the chance they secured to journey with Rama for some little distance. They felt that it was a gift earned in previous lives. They walked in front showing them the track. Behind them, Rama went with Sita, Lakshmana and Guha. They went as far as the bank of the Yamuna river, and there, they took leave of Rama and turned back, without the least will to do so. Sita, Rama and Lakshmana were very pleased with the pupils for the help they rendered; they blessed them with all their hearts and allowed them to leave. Then, they got ready to have the holy bath in the sacred Yamuna. Meanwhile, the inhabitants of the villages on the bank noticed these visitors of extra-ordinary charm and splendor, and gathered around them, wondering who they were and whence they came and what their names were. They were too shy and too afraid to ask. They were talking in whispers among themselves. Sita, Rama and Lakshmana finished their bath, with out paying heed to them, and, coming on to the bank, Rama called Guha near, and said, "Dear one! It is a long time since you joined us; it is not proper that you should spend so much time with us. You must carry out your duties to your subjects. Go home now, to your post of duty." He then gave him permission to leave. Guha found himself helpless to answer him. "Can anyone give up the wish-fulfilling gem that he has come by? How unfortunate I am to be forced to do so!" he wailed. He could not disregard the command of Rama. So, he prostrated before Sita, Rama and Lakshmana, and showered on his head the dust of their feet. He left their presence, most unwillingly. A short time after Guha left them, the three resumed their journey. Soon, they saw before them a City, which shone brighter than even the City of the Nagas. As they neared the light, they wondered which City it was. The nearer they came, the more delighted they were at the grandeur and charm of the City and its suburbs. Reaching quite near, they took it to be Amaravathi, the City of the Gods and they were still more delighted. They felt that the citizens must be gods, not men. They sat under a tree in its cool shade and admired its splendor and magnificence. The people came around them and questioned among themselves whether they had come down from 'heaven', and were the Immortals themselves. They ran into the town and spread the good news that some divine personalities were coming into the City bringing great good luck with them. Every one who heard them ran towards the visitors and vied with each other in attending to their comforts. Some placed milk before them; some spread fruits; all looked at them without even a wink! No one could leave them and go back. They stood unwilling to depart. One of them, bolder than the rest, came forward, and spoke; "Sirs! Your charm and imposing personality make us infer that you are princes of royal blood. But, you are journeying by foot along these rough jungle paths, with this damsel. You are climbing mountains and crossing rivers; you are hard travelers braving all the dangers of the trek; so, we have to conclude that you are like us, mere citizens. We cannot understand how you manage to travel across this forest where lions abound and herds of wild elephants roam. And, you have with you this tender embodiment of loveliness and beauty. Have you no kith and kin, no friends and comrades, no well-wishers? If there were any such, certainly, they would not have allowed you to venture on this journey". He inquired into the nature and cause of the journey and put a number of other questions to Rama. Meanwhile, a woman advanced from the gathering towards them, and addressed Rama thus; "0 Prince! I am placing a prayer before you. Woman that I am, I am afraid to express it. Pardon my effrontery. We are common folk, unacquainted with verbal finesse. Your physical charm reflects the luster of emerald and gold, which seem to be the source of your brightness. One of you has the complexion of the rain-cloud, while the other is resplendent white. Both are as enchanting as a billion Gods of Love, moulded into human bodies. Again, we are not aware how this sweet damsel is related to you? She has the exquisite charm of the Goddess of Love, Rathi Devi. Watching her modesty and innate humility, as well as her charm, we women are ashamed of ourselves. Kindly tell us who you are, and for what purpose you have come thus wise." Listening to their prayers and watching their eagerness and joy, Rama and Lakshmana were very much amused. Just then, Sita turned towards the women and spoke to them thus: "Sisters! This simple, sincere person with the golden complexion is Lakshmana. He is my Lord's brother, a younger brother. Then about the dark-blue person: he with the Lotus-petal-eyes that enrapture the worlds, with the long, strong bow-arms, (here, she turned towards Rama), this is my Lord, the very breath of my life." Saying this, she bent her head and looked at the ground. Just then, a young maiden interjected, "Ma! You haven't told us your name!" Sita immediately said, "My name is Sita. I am known as Janaki, the daughter of Janaka." The women looked at each other in wonder and appreciation and then, with one voice, they blessed Sita profusely, saying, "May you both be as happy a couple as God Siva and Goddess Parvathi and may you live together, as long as the Sun and Moon, as long as the Earth rests upon the hood of the snake Adisesha, in harmony and unbroken joy." Rama too spoke to the men and informed them that they had come to see the grandeur and beauty of the forests and that their journey so far had been quite comfortable and useful, that they were not in the least exhausted or in-convenienced. He asked their permission to leave, and then, they turned to the forests again. Having nothing left to do, the men and women hied homeward. Sita, Rama and Lakshmana wended their way, talking among themselves about the citizens and the questions they asked, the affection they manifested and the joy that glinted in their eyes. 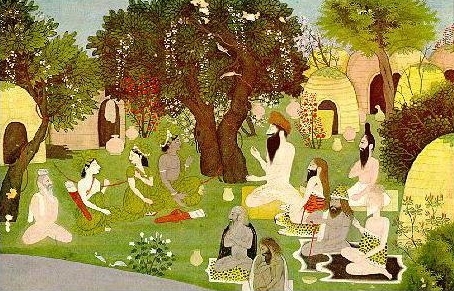 Suddenly, Rama noticed signs of exhaustion on the face of Sita, and proposed that they rest a while under a shady tree. A cool broad stream flowed near by. Lakshmana ventured into the jungle and soon gathered some fruits and tubers, which all three ate with relish. They spent the night there, quite happily. At dawn they awoke, and finishing the morning ablutions, they started off on the next lap of their journey. Soon, they entered the fearsome recesses of the forest. The towering peaks, dark dreadful tangle of trees, and the deafening roar or flooded streams, produced a queer feeling of awe and mystery. Right in the midst of that frightful area, they came upon a patch of garden, nursed and fostered by man, and upon it, a hermitage that was charming to behold. That was the ashram of the sage Valmiki. On one side of the hermitage rose the cliffs of a tall mountain; on the other side, far below, at the bottom of a deep trough, flowed a murmuring stream. The hermitage was a picture of beauty; it shone like a gem on that green carpet. Sita felt considerably relieved and assuaged when her eyes fell on that picture. 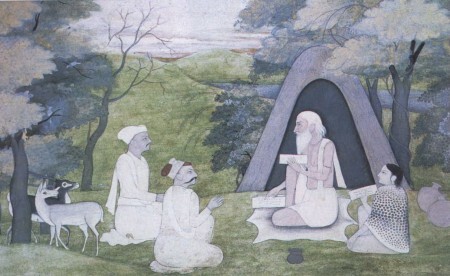 Learning from his pupils that they had entered the garden Valmiki emerged from the hermitage and appeared at the door. Sita, Rama and Lakshmana hurried forward and fell at the feet of the sage. The sage too, moved forward and, as if he had known them long, he welcomed them, with fond embrace. He invited all three to enter the hermitage. The sage Valmiki provided comfortable seats for Rama whom he loved as his very breath, and for Lakshmana and Sita; he called for fruits and edible tubers and placed them before the three. As desired by Valmiki, they partook of them, and expressed their pleasure. Valmiki sat before them, watching Rama and quenching the thirst of his eyes. He was filled with inexpressible delight. With utmost humility, Rama addressed the great sage thus: "Most venerable Sage! You are conversant with the past, the present and the future of all; so, the reason why I have entered this forest must be as clear to you as the berry in one's palm. Nevertheless, I feel it right that I should discharge my duty of informing you why I am here, with my wife and brother." Then Rama described how Queen Kaikeyi sent him into exile in the forest, and how brother Bharatha was crowned as ruler of the realm, according to the promise made by the father. The sage listened to the story, and communicated his joy with a face lit with smiles. He said. "Rama! As you fulfilled their desires then, you have satisfied my desire now. My austerities, vows and yearning have at last yielded fruit today. I must confer on Kaikeyi my heartfelt gratitude and a share of the bliss I am now enjoying." Valmiki sat long in silence, with his eyes closed, while trying to keep within control the emotions of gratitude and joy surging inside him. Tears gathered in his eyes, tears of Ananda, and they rolled down his cheeks in big drops that chased each other. Rama broke the silence and said, "We shall reside at the place where you direct us to live. Indicate to us a place where we shall not cause any trouble to any one and where we shall not come in the way of hermits and hermitages; give us proper advice. We shall put up a 'thatch' of leaves at that place and spend some time therein." Rama laughed within himself when he listened to the revered sage. Meanwhile, the sage spoke again, soft and sweet, with a smile beaming on his resplendent face. "Rama! I know in reality you reside in the hearts of your devotees. Now, I shall tell you the best place where this form of yours can stay. Listen. You can reside there with Sita and Lakshmana. Select those whose ears, like the ocean, receive gladly the streams of stories recounting your exploits, and are ever happy, listening to the narratives of your divine acts and words, whose tongues are busy repeating your name and tasting its nectarine sweetness, whose throats recite and revel in the recitation of your praise and of your words which are soft and refreshingly sweet, whose eyes yearn to see your cloud blue form as the Chataka bird yearns for the first cloudburst, whose ever-present longing is to discover you anywhere, in any quarter, and delight in the discovery when you find any such. O! Rama, dwell there, with Sita and Lakshmana. "Rama! If you wish that I elaborate further, listen: Stay in the heart of the person who discards the evil in others and loves them for the good they have, who trudges along the journey of life in the path of morality and integrity, who observes approved limits of conduct and behavior, and who has the faith in thought, word and deed, that the Universe is your creation and that the entire objective world is your body. "Nevertheless, since you have assumed now this human body and come here in order to carry out the commands of your mother and father, and questioned me in that role, I am venturing to answer, as if that role is real. You can reside on the Chitrakuta Hill. It has all facilities for comfortable stay. It is a holy place, and a charming beauty spot. The atmosphere is saturated with love and peace. Lions and elephants roam together there, with no trace of rivalry. The river Mandakini, extolled in the Vedas, flows round the hill. Sages like Athri live there in hermitages, which you can visit and render more sacred. 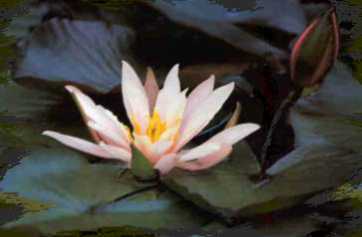 Confer your blessing on that sublime spot and on that dear divine river." As soon as Valmiki gave this direction, Rama agreed and receiving his permission to leave, he resumed his journey with Sita and Lakshmana. Within a short time, they saw the Mandakini, and were happy to bathe in its sacred waters, and perform the prescribed ceremonial rites. They rested awhile under a shady tree, and ate some fruits, before walking over the grass for some distance, admiring the verdure and the scenery. Then, Rama spoke to Lakshmana thus: "Lakshmana! I am at a loss to decide on the exact spot where we can erect a cottage of leaf thatch and bamboo for our stay in this place; I do not find it easy to say which place is good and which is not; so, select and fix upon a spot." No sooner did these words fall on his ears than Lakshmana crumpled on the ground right at the feet of Rama. He was in evident anguish. "What wrong have I committed that you should speak to me thus! Is this a sentence for any sin? Or, are you testing me, and my nature? Or, are you joking and making fun of me? ", he asked. He was in great sorrow and he stood with his head bent with fear and anxiety. Rama was surprised at his behavior. He went near him and clasped him to his bosom. "Brother! What happened now to make you so sad? I cannot guess why you are so heart-broken," he said. "Tell me", he pleaded, "tell me the reason, do not prolong my astonishment and sorrow." Lakshmana replied immediately. He said, "Brother! I have surrendered everything to you. I have no likes and dislikes. What is pleasing to you is, on that account, pleasing to me. You know that this is the fact. But, yet, you now ask me to select a place which I like and erect a cottage for you thereon! My heart received a shock when you directed me to exercise my will. Order me where it is to be raised; I shall do so. Be merciful, do not speak to me in this strain, bless me by accepting the surrender I am offering at thy feet of all of me, the will, the intelligence, the mind, the senses, the body, all with no exception and no reservation. I am your servant, following you in the hope of having the chance to serve you. Use me. Command me, and have the command obeyed and the action accomplished." When Lakshmana prayed and supplicated so sincerely, Rama consoled him and pacified his feelings. "Lakshmana", he said, "Why are you worried so much on this little matter? Do not take it so much to heart. I gave you that direction in just a casual way. I am not unaware of the loyalty that fills your heart. Well. Come along with me. Right! I shall select the spot myself." And, with Sita by his side, he took the forest track, along with Lakshmana, and shortly, they sighted the northern bank of the Mandakini river. That length of bank was curved like a bow; it appeared as if the bow was held by the Chitrakuta peak standing behind it like a hero. One felt that the arrows it was ready to let loose were Sense control. Mind control, Charity, Renunciation, etc., and the target they were intended to destroy was the Gang of Sin. Rama described the spot thus and added: "This hero will not withdraw from the fight"! He directed that the cottage be built on that captivating spot. Lakshmana requested Rama and Sita to rest a while under a tree, and set about collecting poles, leaves, creepers and fiber from tree-barks to spin ropes from. In order to raise a hut spacious enough for three, he dug pits, planted poles, and labored quickly to complete the construction. When Sita and Rama rose from the shade after some rest, they found the cottage rising before their eyes, a thing of beauty, certain to be a lovely home by all counts. Rama felt that he too should give Lakshmana some help in his work, and so, seeing his brother on the roof, giving the finishing touches, he handed him from the ground bits of string to tie the bundles of dry grass to the cross poles in order to thicken the thatch. Sita too desired to give a helping hand; she plucked long leaves from the tree branches Lakshmana had brought, and gave sheaves of them into Rama's hands to be passed on to Lakshmana. The house was ready for occupation, even before sun set. Rama looked often and long at the neat little cottage, and he praised the devotion and skill of his brother to Sita, in high terms. Sita too appreciated the house and said that she had at no time seen a dwelling place of such charm; she had for a long time yearned to live in just such a habitation. She told Rama that her long-cherished desire was fulfilled that day. Meanwhile, Lakshmana came down from the roof; he went round the cottage to examine whether anything was wanting. Then, he asked permission from Rama to proceed to the Mandakini for a bath. A short while after, Sita and Rama both went to the river and had their bath; they returned to the cottage and partook of the fruits that Lakshmana had gathered in the morning, and slept soundly on the floor of their new home. Before another day passed, the news that Sita, Rama and Lakshmana had taken residence on the Chitrakuta Hill spread among the hermits of the forest and groups of them, bringing their pupils and comrades, approached the sacred cottage, and after taking Darsan, left for their hermitages. Rama asked them about their health and progress and also enquired about the difficulties they encountered. Rama assured them that whenever they required his service, he was ready, with his brother, to go to their rescue. But they mentioned no difficulties and referred to no troubles. They said, "Rama! The fact that we have been able to see you is enough to make our lives trouble-free. We have no difficulties, nor can any difficulty come into our lives. Your Grace is enough protection for us." They sat petrified with wonder at the charming personality of Rama. Rama welcomed the ascetics and treated them with affectionate regard. Seeing him and being in his presence cooled the pining hearts of the ascetics and gave them immense consolation and confidence. A deep calm descended on their consciousness. Rama is predominantly Love. He made every one of the forest-dwellers happy. He discoursed with them, and slaked the thirst for Love that was tormenting them. Those who came to him, whether ascetics or hunters, received from him instruction that was appropriate to their aspirations. Rama elevated their occupations into a higher level by his sympathy and counsel. Those who went to him and returned from his presence talked among themselves of his virtues and compassion; they reached their homes extolling him and congratulating themselves. The forest where they had resolved to reside shone with a new glory and thrilled with a new joy, right from the day they entered the cottage. It was charming to the eye and saturated with a coolness that delighted the mind. The ascetic communities that lived in the forest had fear and anxiety removed from their lives; in their place, Ananda grew and flourished. Even the hard-hearted hunter clans started observing the rules of morality; they soon became ornaments of the human race. The Vindhyan Range was sad that the Chitrakuta Mountain had won this fortune. Why? Not the Vindhyan Range alone; all mountain ranges continued to be sad, for they could not attract Rama to select them for his residence. Lakshmana had the unique chance of feasting his eyes upon the Lotus Feet of Sita and Rama, and imbibing the affection they bestowed on Him; so, he forgot everything else, and immersed himself in supreme spiritual ecstasy, Sath-Chith-Ananda. His mother, Sumithra Devi, or his wife Urmila, or his other kinsmen did not appear before his vision, even in dreams. So austere was his refusal to remember them. Sita too never recalled, even for the fraction of a second, her relatives or parents, or the Cities of Mithila and Ayodhya. She was fixing her eyes and attention on the Lotus Feet of Sri Ramachandra. That was the veritable festival for her eyes; she watched the stream of sages and their consorts who came to Rama for instruction and guidance. Time flowed by her without her noticing the passage of night and day. The chakora bird delights to the point of self-forgetfulness when the moon shines in the sky; so too, Sita reaped delight, fixing her eyes intently on the Face of Rama. For Sita, the lovely little grass-thatched bamboo cottage was so attractive that she forgot the palace of Mithila, where she grew up into maidenhood, and the palace of Ayodhya where she spent years as the Princely Daughter-in-law. That cottage was to her more pleasing and palatial than all the mansions she knew. Off and on, Rama used to relate stories of ancient heroes famed in Puranic lore and describe the varied achievements of persons who had mastered the mysteries of austerity. These were heard by Sita and Lakshmana eagerly and with enthusiasm. In the midst of these narrations, Rama used to remember his parents, and remind them of their grief at being separated from them; on these occasions, Sita had her eyes filled with tears at the thought of her father-in-law and mother-in-law. Drops rolled down her cheeks when she pictured the plight of Queen Kausalya. Suddenly, she pulled herself up, with the thought that she was with Rama, the Lion among Men, that it was not proper to give in to sadness or anxiety in the forest while she was in his presence and that whatever happens must be welcomed as the leela (cosmic play) of her Lord. Thus, Sita spent her days in undiluted happiness in that cottage, with Rama and Lakshmana. They too were guarding her like the lids of the eye against the slightest disturbance or noise that might affect her equanimity, and raise fears in her mind. No worry affected them; no grief or pain or shade of sadness marred their happiness at Chitrakuta.